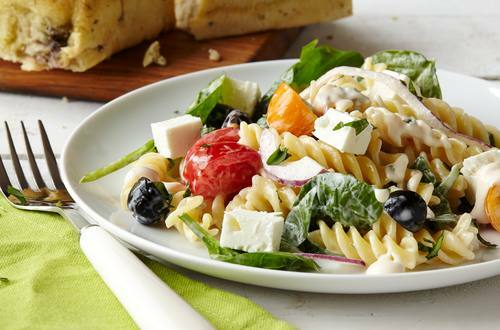 A great summer salad with penne pasta, olives and feta wrapped in creamy Hellmann's® or Best Foods® Real Mayonnaise. A Greek pasta salad recipe bursting with Mediterranean flavors. 1 Cook fusilli according to package directions. Drain and rinse with cold water until cool. 2 Combine Hellmann's® or Best Foods® Real Mayonnaise, vinegar, olive oil, oregano and brown sugar in large bowl. Stir in cucumber, onion, tomatoes and olives. Add fusilli and spinach; toss. Top with feta.